This adorable vacation cottage house plan appears humble on the outside, but it is certainly grand on the inside with enough coziness to call it home away from home. A vaulted ceiling lends to a spacious feeling in the living/dining area which is bathed in natural light from the clerestory windows. Boasting efficiency, the kitchen is designed as a convenience not a chore. Storage space is offered in the bedroom to hold all of the trendy vacation-wear and in the linen closet for crisp clean sheets and fluffy towels. Whether seashells or dried mountain flowers, souvenirs are proudly displayed in a built-in niche just inside the front door. Leading to more sleeping accommodations in the loft, is a unique space saving spiral staircase. 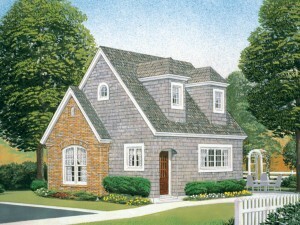 As a weekend retreat or a summer home, this cottage home plan offers the amenities of home with efficiency and class. 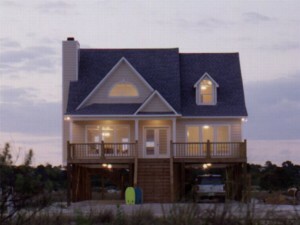 Browse more cottage home plans like this one in our cottage house plan collection. If doing laundry seems like too much of a chore and you have to talk yourself in to it every week, consider updating your laundry room. 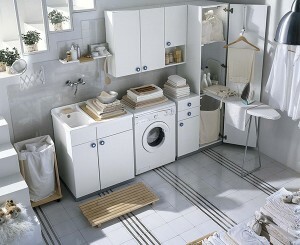 Below are some simple tips to help you improve your laundry room and make it a more enjoyable space in which to work. Additionally, some ideas will help you make your laundry room more efficient saving you time so you can do something else that you better prefer. Repurpose your Entertainment Center – With flat screen TVs, entertainment centers are becoming a thing of the past. Repurpose your entertainment center and move it to the laundry room. Rearrange or remove shelves to accommodate laundry baskets and laundry supplies such as stain removers, an iron and a jug of bleach. Add a hanging rod to one section so you have a place to hang clothes after you iron them. If you don’t have and old entertainment center, consider a baby changing table. It is the right height for folding and has storage shelves below. No matter what piece furniture you add to your laundry room, paint it with a high-gloss paint to give it a durable and washable finish. Create and Entertaining Laundry Center – Speaking of flat screen TVs…..Mount a small flat screen on your laundry room wall or buy a simple radio and place it on a laundry room shelf. Your laundry chores will be more bearable if you can watch part of a favorite TV show or listen to your favorite tunes while you sort, fold and iron your laundry. Brighten your Space – If you have a laundry room in the basement, chances are you’re looking at concrete walls while you’re working in the laundry room. Brighten the space by adding a fresh coat of white paint to the ceiling and walls. Gather Cleaning Supplies – If you don’t have a lot of room, add a lazy Suzan to a nearby shelf. It will keep all of your detergents, stain removers, etc., in a easy-to-access place. Just spin the wheel to find what you need. Get Ready to Iron – Mount a wire iron holder to the side of a cabinet or laundry room wall so the iron is always at your fingertips. Also, mount a pull-down/fold-down ironing board to the wall. It saves space and is easy to “put away” when you’re finished. Get Creative with a Drying Rack – If floor space is limited, repurposed an accordion-style drying rack by mounting it to the wall to air dry delicate items. When it is not in use, simply collapse it back against the wall. With these quick tips, your laundry chores won’t seem like chores as much anymore. For more ideas about updating your laundry room, please review, “Update Your Laundry Room for Easier Wash Days”.